I was driving home from a long, hot and difficult rescue when the phone rang. I was already dehydrated and tired, and I needed some time to rest and recover. I wasn't ready to do another rescue in this heat. I learned the hard way once before about trying to do a rescue before I am ready. 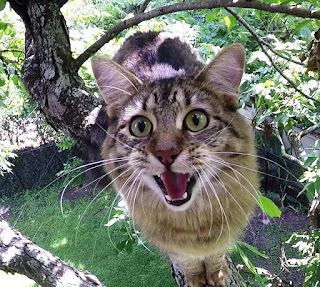 The caller was Paula, and her cat, Doodle, had been stuck in a tree in her neighbor's yard since the day before. Paula had an appointment but would be back in a couple of hours. I agreed to meet her when she got home, as that would give me enough time to eat some lunch, rehydrate and get some rest. 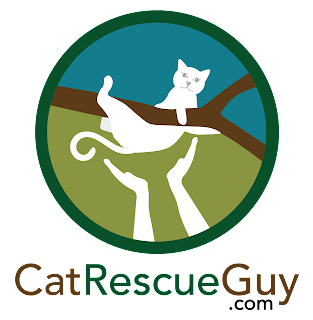 Plus, it sounded like the cat would be friendly and cooperative, so maybe the rescue would be fairly easy. I met Paula at her house, and she led me around the corner to the neighbor who graciously allowed us free access to her backyard. 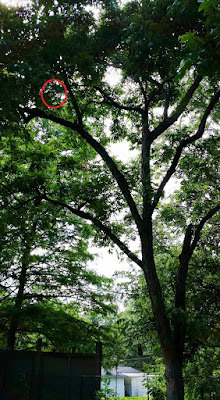 There in the backyard I saw a tall pecan tree and quickly spotted Doodle about 35 feet high. Doodle walked along a branch calling for us. Paula has two other cats, and one of them got stuck in a different tree in this same backyard a while back. The way she got it down is interesting. As part of her routine, whenever she would leave her house for a while, she would tell the cats bye by saying the old World War II era expression, "Bye, bye; buy bonds" before going out the door. When the cats heard that, they knew she was leaving for a while. So when Paula was unable to coax her cat down from the tree, she left saying, "Bye, bye; buy bonds," and began to walk away. 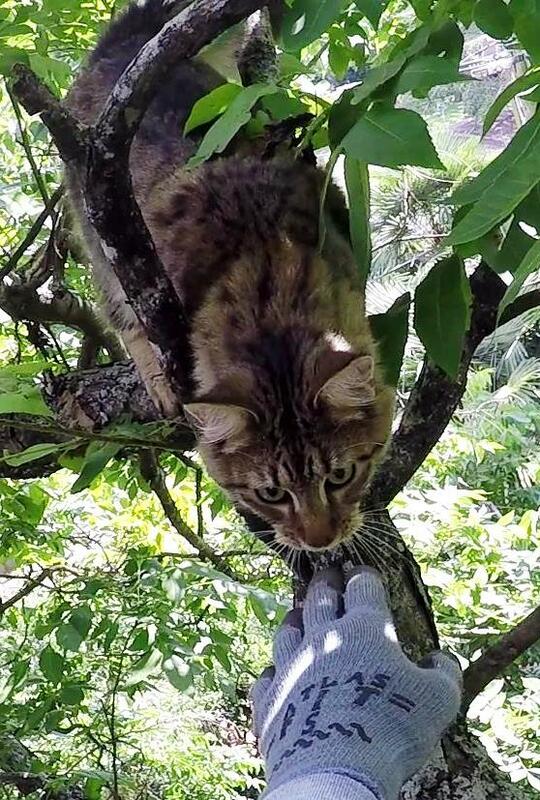 The cat immediately came down on its own. 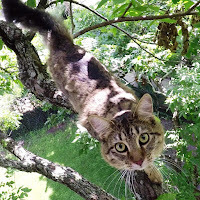 Of course, she tried using the same technique on Doodle, but he was much higher and could not work his way down. 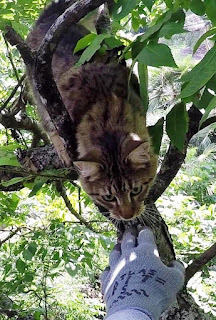 Setting my rope in the tree distressed Doodle a bit, and when I climbed up to him, he was cautiously positioned far away from me near the end of the branch. 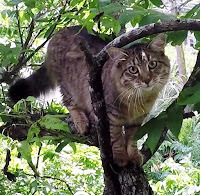 It probably worked to our benefit that I needed several minutes to get myself securely into position on his branch, since that gave him time to settle down and see that I was not focused on him. By the time I was ready to focus on him, he was ready to come to me. He walked slowly toward me until he was within reach of my outstretched hand which he sniffed. He came closer and sniffed again. This time he let me pet him, and we both relaxed as the cloud of uncertainty blew away. He was a sweet boy, and he knew he could trust me. I offered him a can of food to further cement our friendship, but he wasn't very interested at the moment. Just the same, I put the food in the back of the carrier and held it up to him. He was curious and not at all disturbed by it, but he did not go inside. I gave him a few minutes and some reassurance, and then he decided to go inside to sniff the food. I tucked his tail inside and closed the door. Easy and gentle. I brought Doodle down and gave him to Paula. She walked him home while I began to pack up. When I finished, I went to Paula's house to get the carrier and see how they were doing. There I met Doodle's two siblings, one of which, Taz, is Doodle's litter mate. Taz did not recognize Doodle, because his scent was different. Consequently, to Taz, Doodle was an strange intruder who deserved no hospitality. Taz, hissed and swatted at Doodle who was simply confused by the rude reception he was getting. After all, Taz smelled the same to him. I have seen this happen before, but hopefully they will get back to normal soon. While I visited there, it was clear to me that Paula loves her three cats and that they mean very much to her. The cats have a very good home with her and are enjoying a life of luxury. As I left, Paula thanked me again saying, "You saved my best friend." That beautifully summarizes why I find this so rewarding and meaningful.